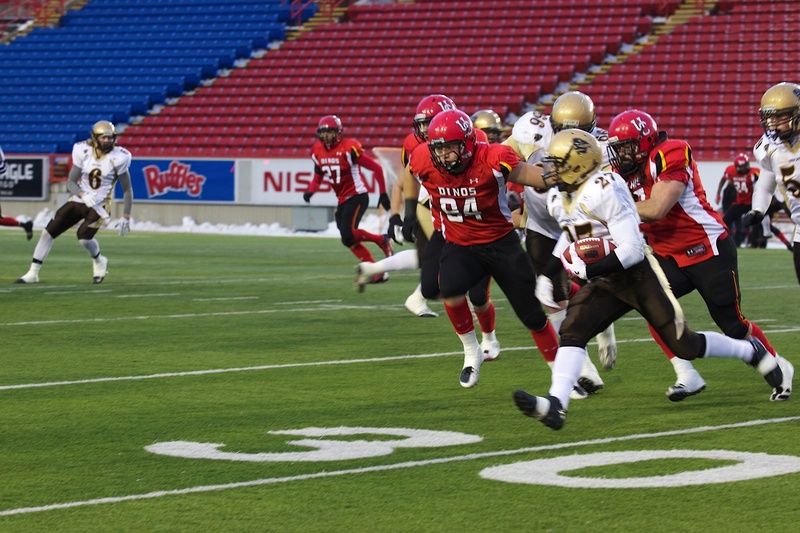 Playing in their first playoff game since 2007, the Manitoba Bisons were completely dominated by the Calgary Dinos in a 57-18 blowout. The defending conference champion Dinos will play in the Canada West finals, looking to secure the Hardy Cup for the fifth consecutive year. 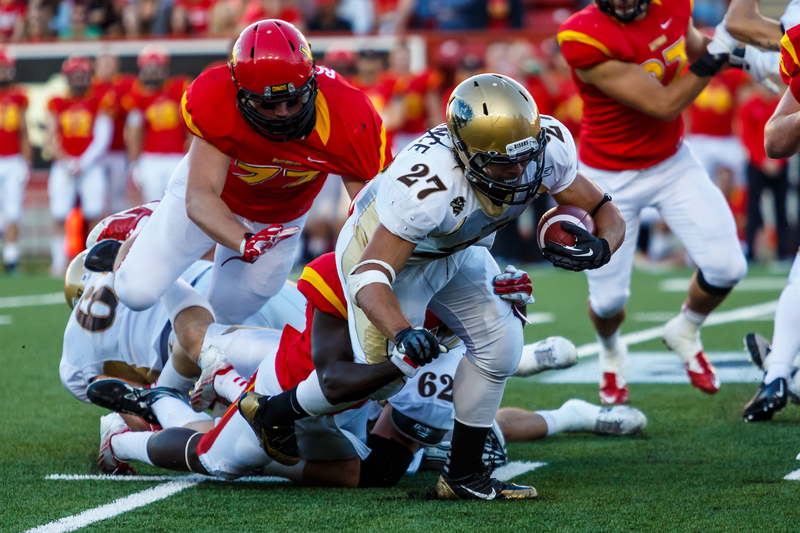 The blowout comes one week after the Dinos and the Bisons broke team, Canada West, and CIS records with a crazy 78-54 offensive shootout, a victory for Calgary that included 42 points scored in the second quarter alone. Simply put, Calgary was the better team in both games, but especially in the playoff game. Manitoba turned over the ball five times in the first half as Calgary amassed an impressive 393 yards of total offence and a 41-0 lead by halftime. The Dinos controlled the line of scrimmage on both sides of the ball and capitalized on every opportunity the Bisons provided. Making things worse for Manitoba, Anthony Coombs—one of the most explosive offensive weapons—was forced out of the game early in the first quarter with a lower body injury. To lose a player of Coombs’ caliber at any point is disasterous, and especially so early when the game was still up for grabs. It seemed to set the tone for the rest of the evening. The injury bug bit the Bisons again in the second half, as another key weapon, Nic Demski, left the game. Cam Clark struggled in the first half, completing only five passes for 55 yards. Clark finished the game completing 12-of-34 passes for two touchdowns and one interception, in what was the last game of his CIS career. Ryan Marsch came in briefly during the first half, but his only pass of the game was deflected, intercepted, and returned for a touchdown. With Coombs and Demski out, the Bisons rallied around power back Kienan LaFrance. He ran for 124 yards and a touchdown on 22 carries, and hauled in two touchdown passes for a total of 58 receiving yards. The Bisons played honourably and, just like the week before, never showed signs of giving up despite the lopsided score. The loss marks the end of an era for Bison football, as they look forward to moving into Investors Group Field, where they will organize and prepare for their first season at the new home for football on campus. Calgary will host the Regina Rams for the 76th Hardy Cup on Saturday, Nov. 10. The game will be broadcast live on TSN at 3:00 p.m. CST.